As digital health data grows, wearable health-tracking devices mature, tools used in remote diagnosis and treatment improve and with healthcare providers soon to be prescribing mobile health apps, there’s a lot to be excited about at the intersection of health and technology. As Michelle Snyder of InterWest recently pointed out, thanks to the quickening pace of innovation in the space, it may not be long before we see the Tricoder become a reality. There’s a sea change coming to healthcare and consumer and employer involvement in health and wellness, Esther Dyson said recently, so it should be a great time for investing in the space, right? The report offers several explanations for this, including a disappointing IPO market and regulatory and pricing pressures leading to a squeeze on VCs that has led them to more cautious investment strategies. This means, according to Ernst & Young, that investors have been investing less in early-stage companies and instead opting for more mature businesses and those with the promise of quick exits. In addition, the report indicates that VCs have had trouble raising new funds, which means that emerging companies have less access to capital to fund R&D and device testing, etc. But how true is this? For starters, in saying that the healthcare industry has fallen out of favor, the WSJ specifically cites Castlight Health as an example, placing the company outside of its list of the top 50 venture-backed businesses. However, Castlight, which offers a B2B service that enables self-insured businesses to provide their employees with the tools to compare costs and quality of a wide range of tests and procedures, raised $100 million in May. It’s one of the largest investment rounds for a healthtech company on record. What’s more, the raise wasn’t because the company was burning through cash. Instead its executives told us that it still had the majority of its prior $81 million raised still in the bank. The company is expanding its own staff, has been adding new customers and plans to add new products — all of which hardly add up as signs that the company is struggling with its own growth, or in the raising-capital department. Next, as to the Ernst & Young report, VC funds aren’t exactly struggling, but the market is changing. Overall, there seems to be some contraction in the venture capital market, as Redpoint Ventures principal Tom Tunguz wrote in July, although, overall, 2011 was an “average year for venture investing,” though both investment pace and dollars are on the rise. Seed investment has stayed nearly steady over the last decade-plus, and although A rounds may be shrinking and B rounds and above took a hit in the financial downturn, they’ve come back. However, there is a concentration of capital being raised by a smaller number of fast-growing, high-profile startups, and the same might be said of VC funds. In fact, as Ernst & Young found, for the year ended June 30, U.S. and European medtech companies raised $27.4 billion, an increase of 26 percent over the year prior, which, by the way, was a seven-year high. The report is cautious to see this trend as positive, however, because the majority (80 percent) came in the form of debt financing. While this is certainly worrisome, debt financing has been more attractive as interest rates have been low and venture investing in healthtech was up 11 percent year-over-year. While Ernst & Young was unhappy with this relatively small increase compared to the amounts invested between 2005 and 2010, and IPOs have been low, both of those are indicative of overall market trends. The level of venture capital is contracting overall, but it also dropped during and after the financial crisis and is starting to come back. Even if only at a measured pace. Early-stage investing is on the rise, too. In fact, as Dave Chase pointed out earlier this summer, some non-profit hospitals have even begun to launch their own venture funds, while historically larger operations have developed their own venture arms or become LPs in venture funds. But this could represent a trend in smaller operations looking to get into venture investing to help finance promising innovations and medical services and tech. Even if biotech and medical devices took a hit in the first quarter, corporate VC investment (and number of deals) in healthcare was on the rise for the third straight quarter in Q2, as corporate VCs invested record amounts in Q2 2012. 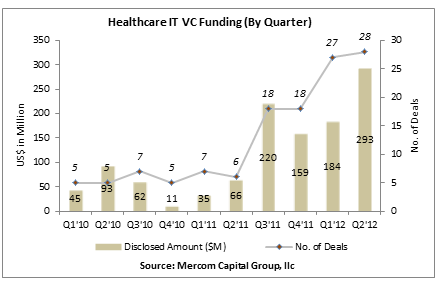 What’s more, a report by consulting firm Mercom Capital placed the total amount and number of VC and M&A deals at their highest levels since 2010 for healthtech IT companies in Q2 2012. Also, a bright sign: According to the report, 61 different investors participated in these funding rounds, with firms like Founders Fund and Venrock participating in multiple deals, with the average VC deal size being $10.5 million. Also in opposition to Ernst & Young’s claim that early-stage capital is hard to come by in healthtech is the Q3 funding report recently released by Rock Health. Back in June, Rock Health released a report that found that 68 digital health companies had already raised over $2 million dollars in 2012. Since then, this number has grown to 103 health companies having raised $2 million-plus in VC money. In context, Rock Health’s data shows that VC funding to digital health startups (through September 2012) came in at $1.08 billion. In nine months, that’s already higher than the $956 million invested through all of 2011. According to the report, this represents a 70 percent increase in total funding compared to Q3 2011, with an 80 percent increase in the amount of deals. Compared to the 103 companies funded in 2012, only around 60 raised last year. Rock Health’s supports this look, too, with the healthtech accelerator’s data showing that VC funding to digital health through September 2012 was at $1.08 billion. 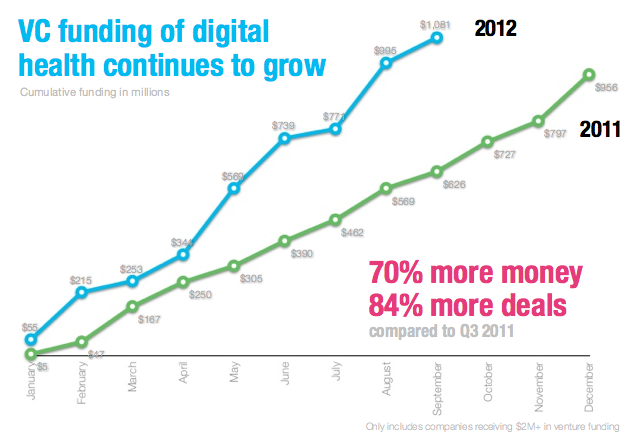 In nine months, that’s already more than the $956 million invested during all of 2011. But perhaps more importantly, the Rock Health report found that 128 different VC firms have invested in digital health in 2012, while 10 percent of these investors are new to healthcare investing. And the majority of investments? 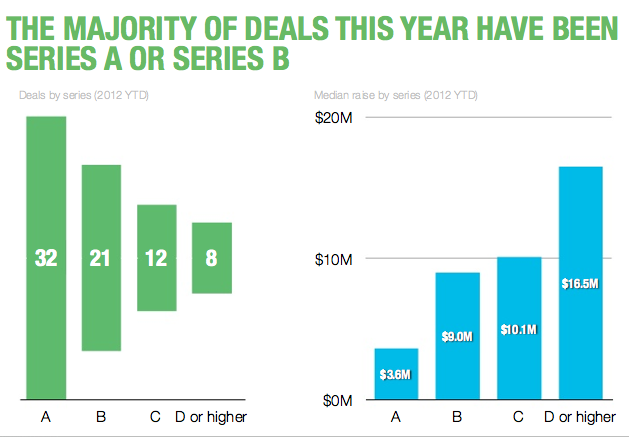 Series A and Series B financings. Historically, it’s been pretty hard for investors, companies and beyond to track trends in venture investing for healthtech startups, as there are great resources for the market at large, but few designed specifically with the health industry in mind. Rock Health just released a new database for healthtech companies and healthtech investors, which aims to be a database for all digital health startups and will include companies and funding data, eventually growing to profile leading individuals in the space. Essentially, it aims to be the CrunchBase for health, or maybe even the health equivalent of EdSurge. This has the potential to be huge for both startups and investors, enabling them to get a better handle on what’s out there and how the industry and its capital is trending. In the end, in spite of the data from Rock Health and Mercom, it’s not unreasonable to find a trend in the underachievement of healthtech. That being said, the WSJ’s saying that healtcare investment has “fallen out of favor with venture capitalists” is BS. Yes, there’s been a big jump in the amount of debt financing and a less-than-expected increase in VC investment over the last year. For good reason, there’s declining faith in the industry’s business models, which have led to a continuing (and unsustainable) up-trend in the cost of healthcare. As Dave Chase outlined earlier this year, it’s no news that legacy IT systems are abysmal — that even in spite of government and health system subsidies, the old guard is having trouble getting doctors and beyond to adopt their technologies. It’s ridiculous that Americans, by and large, pay twice as much as other countries for inferior health outcomes, but that’s because vendors have been producing systems that are complex and user-UNfriendly. Vendors are more focused on activity (on better, faster ways to bill the consumer), than on increasing the quality of treatment and improving outcomes. As a result, there’s a growing movement towards outcome-focused healthcare and growing pressure on healthtech companies to reduce costs and show how their products are increasing efficiency and improving patient outcomes, rather than maintaining the status quo. This may not be great for the bottom-lines of the bigs in healthcare, as the new generation of mobile apps, smart devices, social platforms, and beyond can drive huge gains in efficiency. As all industries increasingly privilege agile software development over solutions that are rigid and difficult to implement, startups attacking the health space, in turn, are moving towards faster implementation. All in all, faster delivery models and the efficiencies produced by patient-empowering and information-leveraging businesses is nothing but positive for end users. It requires a shift and refocusing of business models to those that are patient-focused and payer-savvy (in the words of Ernst & Young), centering on improving outcomes rather than the alternative. And it’s true that, if the big players are unable to do so, investment will continue to decline — as will consumer faith. The adoption of more nimble technology — from software that provides realtime insight, better price comparisons to mobile health tools and smart, telehealth communication platforms — and the creation of more payer-friendly models has the potential to increase revenue for healthtech startups and players. The potential disruptive nature of the new generation of health and medical technologies and businesses may be bad news for legacy vendors and bloated incumbents — and it may lead to the constricting of the market as a whole, smaller valuations at lower prices. Just as we’ve seen happen to the music and publishing industries, there won’t be many investing in building more printing presses and better CD distribution. Healthtech investing, too, is going to shift away from administrative, claims processing and Life Sciences as a whole to digital health and businesses focused on affecting outcomes, those that improve decision support, care coordination and patient engagement. For investors focused on those areas, arguably there’s been no better time to be looking at the health landscape, especially for those interested in having a hand in rebuilding a broken health system. Rock Health report here, E&Y report here.